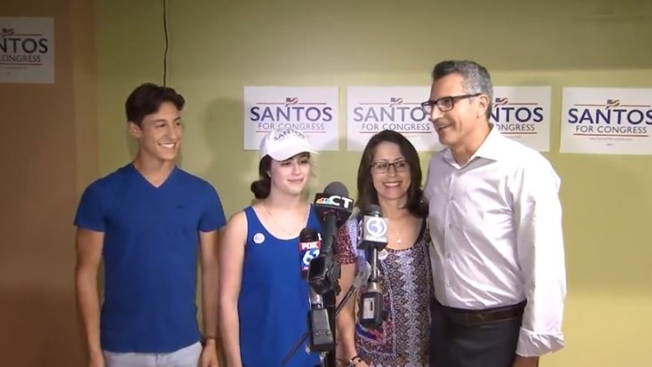 Manny Santos stands with his family after securing the GOP nomination for the 5th Congressional District on Aug. 14, 2018. Manny Santos is the winner of the GOP primary for the 5th Congressional District nomination. Santos had the inside track as the endorsed candidate of the party. He won the party’s support at their convention back in May. He defeated businessman Rich DuPont and former college professor Ruby Corby O’Neill. Santos is the former mayor of Meriden, one of the largest cities in the 5th Congressional District alongside Danbury, New Britain, and Waterbury. He has struggled with fundraising, not even reaching $100,000 in total donations while his presumptive Democratic opponent Jahana Hayes has surpassed $450,000 in fundraising. The winner of the 5th Congressional District will replace U.S. Rep. Elizabeth Esty who chose not to run for reelection after allegations of sexual assault in her office against a former staff member surfaced earlier in the year. To see the full primary night results, click here.